Besides being a nitrogen fixer in the garden, an edible flower to enjoy, first food for bees, red clover or Trifolium pratense can also help cells regenerage and has anti-imflammatory properties that make it wonderful to have as a salve on hand for minor skin complaints like eczema, psoriasis, and acne. This would also be great for soothing sunburn skin, rashes like poison ivy and even boils. Great to have on hand for the Spring and Summer time for those trips to the park, foraging or when camping! 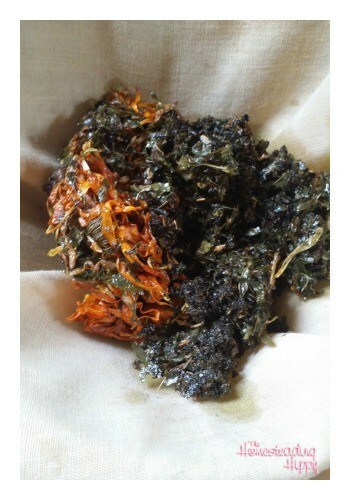 contributor Amanda Erickson shared a great skin care salve recipe that I am going to share with you, with permission. The original recipe called for equal “parts” of the added herbs, and a different infusion technique than I use, so I will show you both. 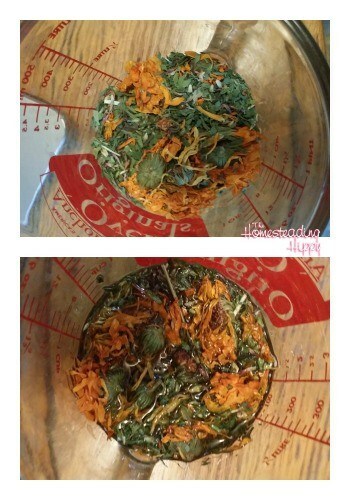 What you will need for this is calendula flowers, red clover flowers, comfrey leaves, beeswax, and olive oil. According to Erickson, a single herb by itself usually isn’t going to correct the bodily issue, so that’s why you often find blends. Easy enough to understand, right? 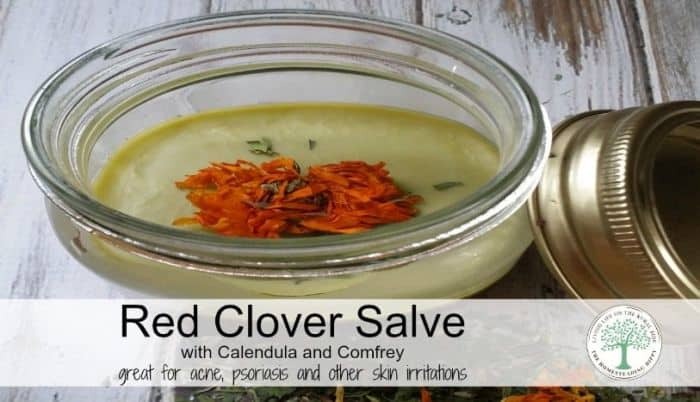 Calendula and comfrey are both great for the skin with similar properties as red clover and this makes a wonderful herbal combination. All the herbs used are dried herbs, which is very important, because water in the fresh flowers could lead to mold in your salve. Amanda’s method of infusing is to add the herbs to a jar, cover with olive oil and set in a warm location for 4-8 weeks, shaking daily. Then, she goes on to have you strain the oil, place in a double boiler and heat over low heat. Add the beeswax and melt. Her method of not giving exact measurements allows you to make the salve as thick or thin as you like, offering a great flexibility. You can add wax if it’s too runny, or oil if it’s to thick. Great option! I like exact measurements, myself because I am a type A+ personality. I also use a “quicker” method of infusing the oils that I have learned in my courses at Vintage Remedies. So, here’s what I did that was just a bit different (and still got the same wonderful salve!) 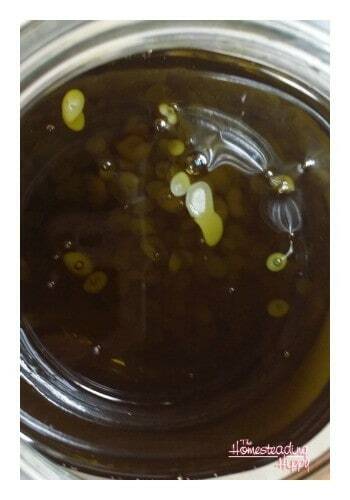 Place the herbs in glass jar and cover with the 2/3 cup olive oil. Sit the jar in a 250° oven for 2 hours to allow the herbs to infuse the oil. Your kitchen will smell wonderful by the way. 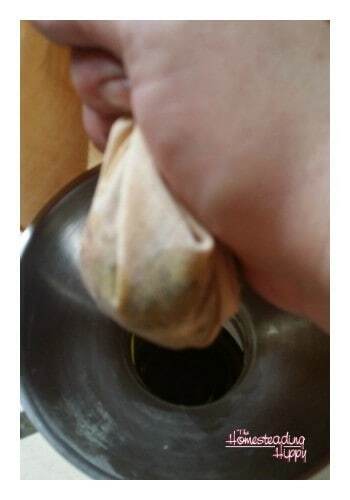 Allow to cool, then strain the herbs into another glass jar, using an old cloth or cheesecloth. Squeeze gently to extract all the infused oil from herbs. The herbs can then be tossed in your compost, or you don’t feel comfortable with oil in your compost, toss in the garbage. Add the tablespoon of beeswax and place back in the warm oven. Allow the wax to melt in completely and stir. Once stirred, allow to cool completely. Label with all the ingredients used, date made and when you would expect this to “expire”. I used the expiration date on the olive oil as my guideline. Do you use red clover? Will you try this salve? As I am not a doctor I can’t “prescribe” it for you…but I would say that making it into a salve and trying it would be worth a go!